If you think that chocolate is only for desserts and snacks, think again. Both chocolate – and cocoa powder – can be a cook's secret weapon! It doesn't always have to play the lead role in a dish – and in savoury cooking it works as an incredible support act. The actual flavour of cocoa powder or a high percentage dark chocolate is quite rich, and more bitter than sweet. This intense flavour makes chocolate an excellent accompaniment to a variety of meat dishes, but it works equally well with earthy vegetables, like mushrooms and aubergines. Typically in savoury cooking you would use chocolate with very high cocoa solids – anything over 70% – so it isn't actually sweet. Use it in small quantities as a building block of flavour, as you would salt and pepper, and it will add amazing depth and complexity. Our nutritionist Emma has put together 7 days of recipes with a dark chocolate twist so there's something for everyone. In most of the ideas and recipes you won't really be able to taste the chocolate itself, but you'll love the extra flavour and richness it imparts. Chocolate is a product of cacao beans that has undergone almost the same process as cocoa – but in chocolate, the cocoa butter is not removed. It's this which contributes to the smoother and richer consistency of chocolate, and also the higher fat and sugar content. Place meat in a large pan and add water – stir. Cover with lid and bring to the boil. Simmer for 15 minutes, stirring occasionally. Once the meat is brown, add all other ingredients except the kidney beans. Cover and cook for 20 minutes. 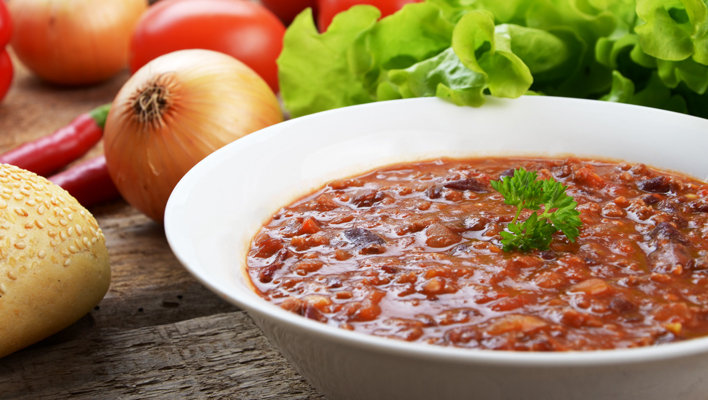 Add the kidney beans and cook for a further 10-15 minutes without the lid. Serve with rice or a baked potato. (Remember to add these calories). Tip! Tastes great the next day after the flavours have developed. Remove from heat, allow to cool, refrigerate overnight. Heat the oil in a pan, add the chicken and fry over a high heat for 3-4 minutes until browned. Remove from the pan with a slotted spoon and set aside. Add the onion and red pepper to the pan and fry over a medium heat for 5 minutes to soften. Add the garlic, chilli powder, cumin, cinnamon and passata and season with salt and freshly ground pepper. Return the chicken to the pan and bring to the boil, stirring. Reduce the heat and simmer for 10 minutes, stirring occasionally until the chicken is cooked through. Add the chocolate and stir until melted. Taste and add a little extra chilli powder, if liked. Serve with rice. 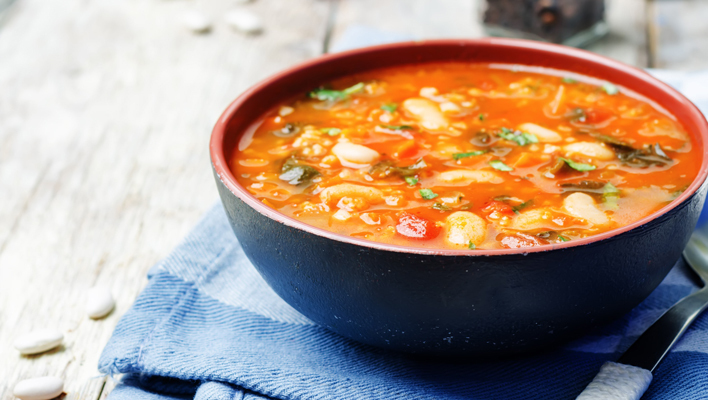 Stir all the ingredients in a small bowl until combined. Store in an airtight container. 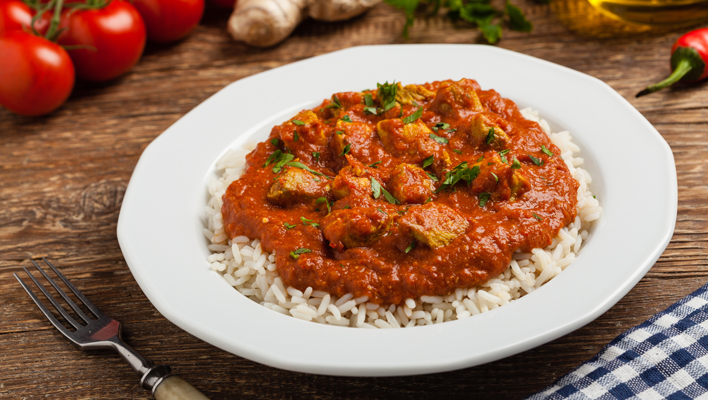 To use, rub 2 to 3 teaspoons of the spice mixture onto a serving of meat, and let it stand at least 10 minutes before cooking. Peel and slice the onion and garlic, add the oil and cook over a low heat until the onions and garlic soften. Add the chilli flakes, paprika and cumin and stir well. Wash and chop the carrot, and add to the saucepan. Pour the red wine and tomatoes in and stir through. Crumble in the stock cube, then add the dark chocolate and 400ml boiling water. Add the drained mixed beans and leave to simmer for 20 minutes, or until the carrot is tender. If you like, pulse the soup in a blender until smooth. Serve hot. Place the aubergine slices in a large bowl and drizzle with 2 tbsp of olive oil. Season with salt and pepper and scatter over the garlic. Toss well to coat. 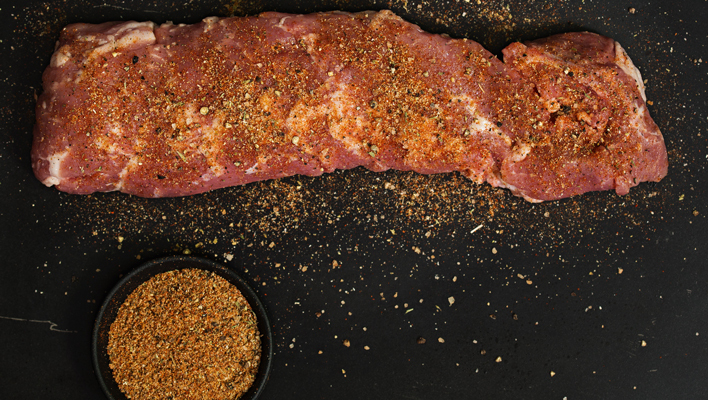 Heat a griddle pan until hot and cook the slices in batches on both sides for 1-2 minutes until soft and charred. Transfer to a plate and wipe down the griddle pan. Brush the ciabbata with the remaining 2 tbsp of olive oil. Return the griddle pan to the heat and when hot, griddle the ciabatta until charred well on both sides. 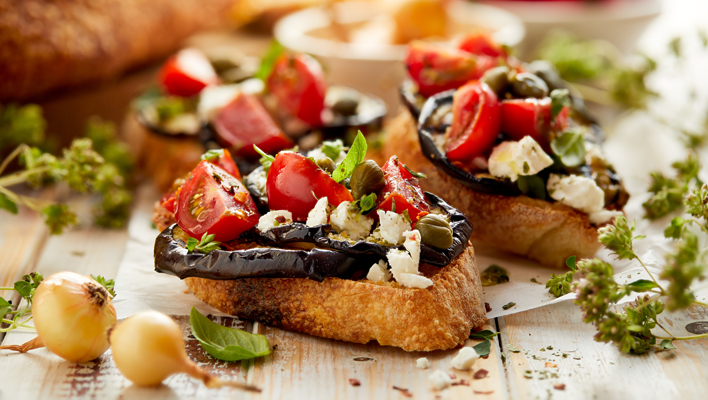 Arrange aubergine slices on the ciabatta, place on the tomatoes and crumble feta cheese over; garnish with grated chocolate. In a bowl mix the porridge oats, cocoa powder and vanilla extract with 1 litre of water. Leave in the fridge to soak overnight. The next day stir through 2 chopped bananas, tip into a saucepan and cook on a medium heat for 5 minutes. Divide between 4 serving bowls. 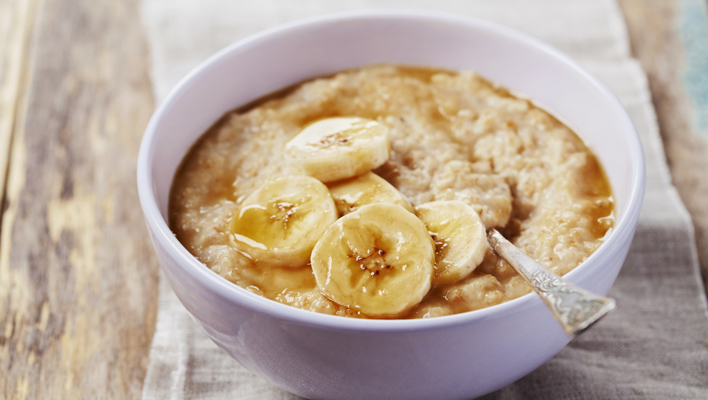 Top each bowl of porridge with a spoonful of natural yogurt, ½ sliced banana and dust with cocoa powder. Mix the sugar and the dark chocolate on a plate. Combine the chocolate liqueur, vodka, chilled espresso, fresh orange juice and orange zest in a cocktail shaker with ice – stir well. 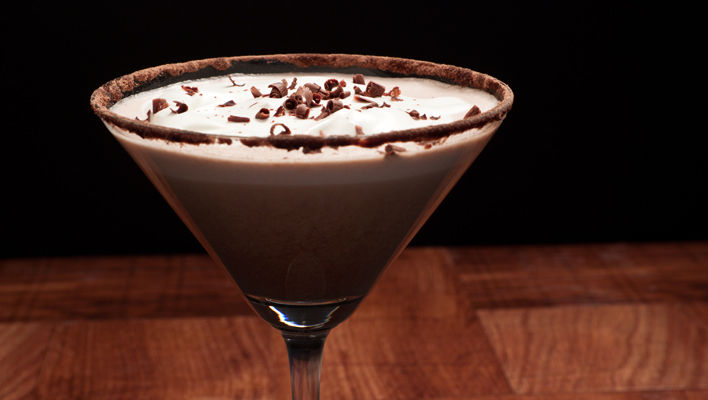 Moisten the rim of a chilled martini glass and dip it in the sugar-chocolate mixture. Strain the cocktail into the glass and decorate with an orange zest.